It was a slow (always that way after a holiday weekend) but good jam night at Patrick’s Pub. Here is a clip of newcomer to the jam, Fred Lawson, on bass and singing You Better Pray. Great song and some great solos from Johnny Vernazza on guitar, Chuck Arcilla on sax, and Walter Gentry on sax – our beloved jam host, along with Matthew Burgher on drums. Note: Video is a bit grainy and a few times out of focus, which happens when the lighting isn’t that good where the sax players stand. But still very worth watching. 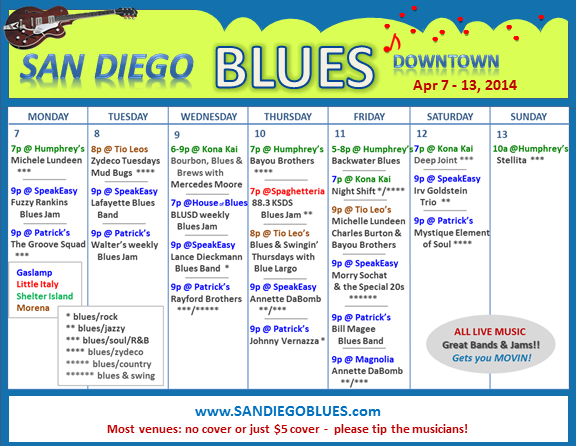 It looks like a fairly light week of blues around downtown. Patrick’s Pub is now starting to host more rock bands, and Kona Kai is going to be closed for renovations for a while. The blues jams are all still happening on Monday (Speakeasy), Tuesday (Patrick’s), Wednesday (House of Blues) and Thursday (Spaghetteria). Each week a new mix of musicians shows up at the JammingOut & BLUSD jam (at House of Blues Voodoo Stage) and gets randomly assigned to get up on stage together. Last night Bobby Hayse, from Indiana, came in and sang cover song Mustang Sally, along with Brandon Cerquedo on guitar (who did the solo in this clip), Doyle Thomas on guitar, Jim Holtz on bass and Tony Garrick on drums. 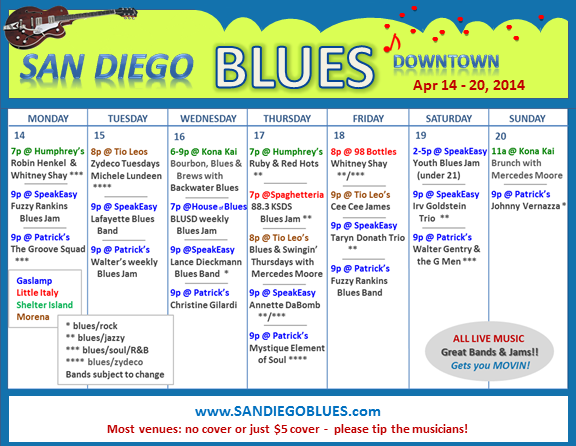 Another good week of blues jams and bands around town. Blues every night in the Gaslamp – at Patrick’s (and every night but Sunday) at the SpeakEasy. There is also the Youth Blues jam on Saturday afternoon that is always incredibly good, and some of the kids that come in are as young as 9 years old. This is an open jam for any young person who wants to come play some blues. This may be Kona Kai’s last week of music out on Shelter Island before they shut down temporarily for renovations. If you love blues, the Wednesday night jam at HOB downtown, hosted by JammingOut.net, the local blues society (BLUSD) and House of Blues, is one of the great jams around town. Here we have Justin Fools on harmonica and singing cover song No Particular Place to Go, supported by Dave Keefer and Judd Austin on guitar, Dale Davis on bass and Lisa Viegas. The evening ended with a little fun on stage as Lafayette Falkquay sings cover song Mustang Sally, along with Junya Isogawa and Rich Giglio on guitar, Kevin Cooper on bass and Billy Wear on drums. 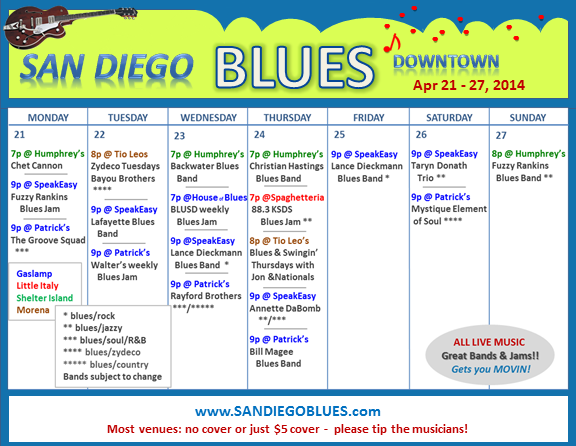 There is a lot of blues happening in the greater downtown area this week, and there is a bit more than usual out on Shelter Island (Kona Kai and Humphrey’s Backstage) and at Tio Leo’s off of Morena Blvd. Morry Sochat & the Special 20s is a Chicago blues & swing band out on tour, and they are coming to San Diego on Friday to play at the Gaslamp SpeakEasy. They should be a lot of fun, especially if you are a swing dancer. Unfortunately I’ll miss them. I head out of town Friday for 10 days, but I hope to catch many of these bands and get up some more video before I go. If you get any good video of these bands in the next couple weeks, please email me with the YouTube link and I’ll get it up on the site. Trey Tosh won’t be playing at Patrick’s this weekend, as scheduled. Instead tonight the R&B band, Mystique Element of Soul, will be on stage, and tomorrow (Sunday) night the Bill Magee Blues Band will be there 9-midnight.